Many people are curious to know how the incredibly detailed imagery are produced. Samples are collected and stored in air tight jars. If these samples are botanical, they are placed into the refrigerator at 4°C in the jars and kept until they are ready to be photographed. The air tight jars and low temperature helps to maintain the structural integrity of the plants for a period of a few of days. The jars must be dry or mould will quickly take root on the samples. Before the samples are photographed, they are prepared which involves several steps. First of all, the samples are placed one by one in a clock glass and observed under a low power stereo microscope. The stereo microscope offers both a wide angle and large depth of field which is perfect for preparation. To clean off fibers and debris an "eyelash brush" is used which helps to disentangle fine fibers and remove debris. Once cleaning is completed, a reference photograph is aquired of the sample under low magnification for the post production stage. For low vacuum SEM, the sample does not need any further preparation. On the otherhand, when carrying out high vacuum SEM, it is crucial that the sample is fixed and dried. This is because if the sample contains water, it will outgas as the pressure begins to fall and thus destroy the vacuum. The fixation step involves preservation of the sample in a highly toxic chemical called glutaraldehyde, diluted to 4% and kept at 4°C for 12 hours. The next step involves dehydration of the sample in a graded series of ethanol solutions which extract the water content from within the cells and tissues. Once the sample is dry, it can then be mounted on the stub. The stub is a small aluminium disk which holds the sample by means of a sticky carbon tab. 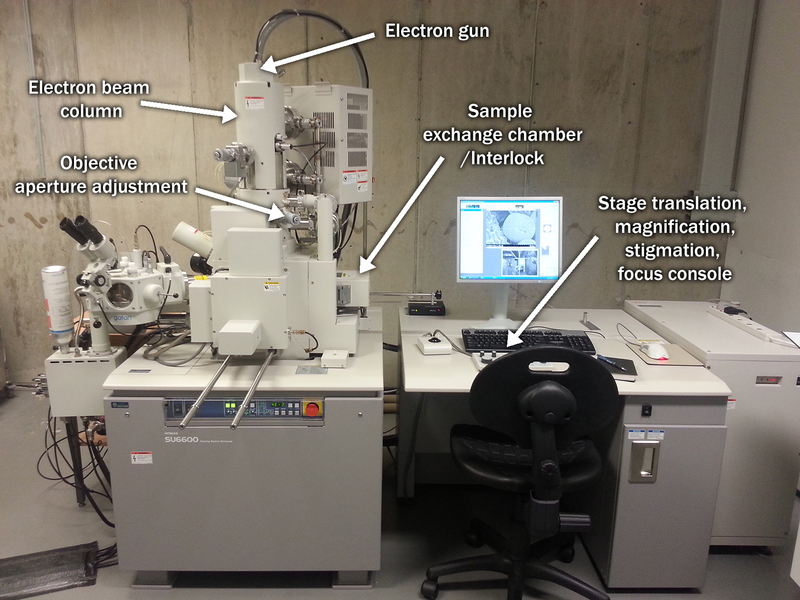 For SEM, the sample must be sputter coated with a thin layer of gold/palladium/platinum. The sample does not require any conductive coating when carrying out helium ion beam microscopy (HIM). 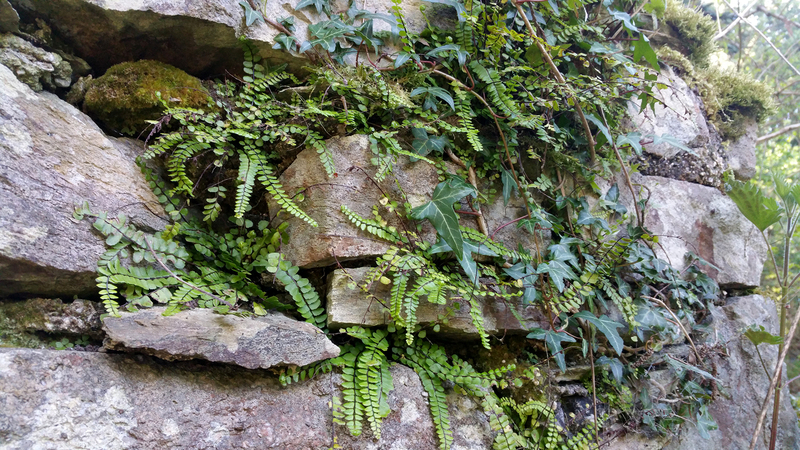 A small fern that goes by the name of Maidenhair spleenwort (Asplenium trichomanes) can often be seen growing from crevices in stone walls. A sample frond of this fern was collected and a series of photographs were made to create a high resolution montage digital image. The SEM above is the Hitachi SU-6600 capable of low-vacuum and high-vacuum with secondary electron detection (SED) and back-scattered electron detection (BSED). Once the sample is mounted and sputter coated, it is ready to be inserted into the sample exchange chamber. 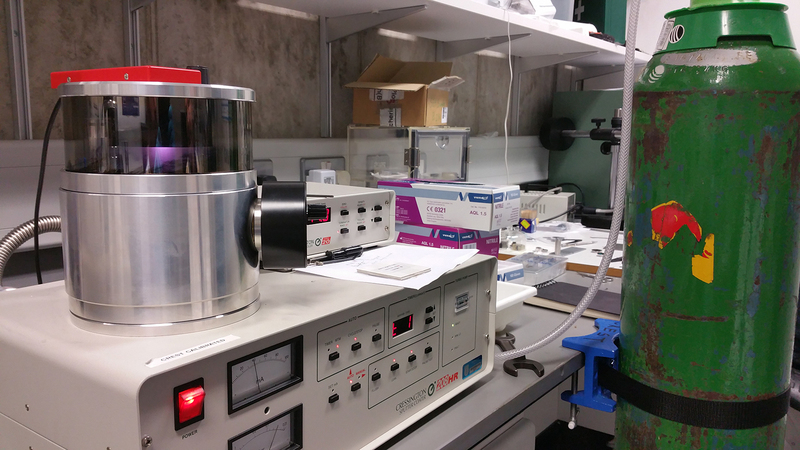 The sample exchange chamber is the interlock between atmospheric pressure and the very low pressure of the sample chamber inside the microscope. It prevents the high vacuum chamber from being opened up to the environment and the pressure increasing within the chamber and from being contaminated. Once the pressure in the exchange chamber has equalised with the pressure in the main vacuum chamber, the sample can be inserted onto the stage for electron beam scanning. This is an image of the individual SEM images stitched together and seamlessly blended. The next stage of post-production involves the very time consuming but enjoyable digital painting process. This is the final digital image (prior to background subtraction) of the Maidenhair Spleenwort with the tiny details clearly visible and with realistic colouring applied. Post-processing is always slow and meticulous in order to preserve the visualisation of the tiny details contained in the image. Features including the leaves, stem, stomata, sori and spores are coloured one at a time with subtle washes of colour to enhance both contrast and aesthetic appeal. Colouring of Maidenhair Spleenwort in particular can take many days to complete due to the immense detail contained within the montage. 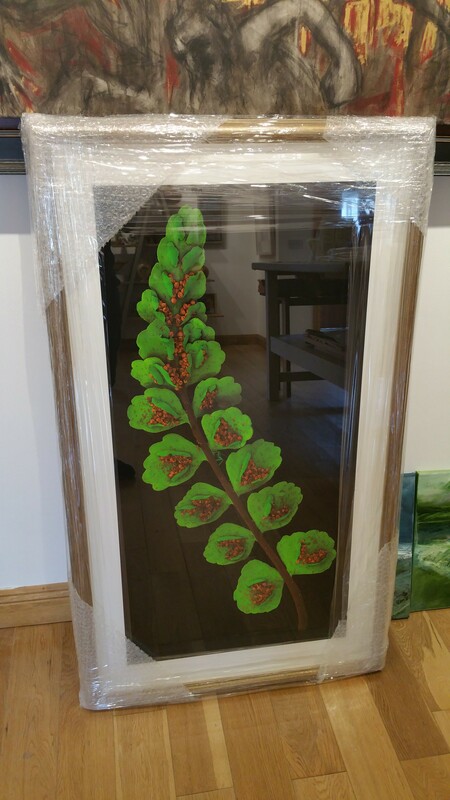 The final product, float-mounted in a beautiful golden frame and ready to be hung.